It’s Christmas Eve which means all of you should just about be getting into the Christmas spirit or else you’ll have the Krampus on your tail. Nevertheless, I know one band that has decided to get into the Christmas spirit and that band is the wildly popular Black Veil Brides. Last year around the same time, the band had unleashed a single on to the world by the name of The Outsider which had fans clinging on to the hopes of a new record in 2017. Now here we are and the band has just unleashed a new single entitled The Last One and has promised that an album will be released in 2018 by the name of Vale. The track starts off making you think that it’s going to be a piano driven track until the twin guitar duo of Jinxx and Jake Pitts take over in this hard charging high octane track. When talking about the album, Andy Biersack said, “The central narrative once again finds ‘The Wild Ones’ characters facing the challenge of moving on from the pain and anguish of their past and looking to a new chapter in their lives. This concept is one that is near to my heart and I believe will resonate with those that find themselves cast on the fringe of society.” The album will be released on January 12 and you can pre-order it here. The band is also heading out on the road in a co-headlining trek with Asking Alexandria and you can check out all the tour dates below. 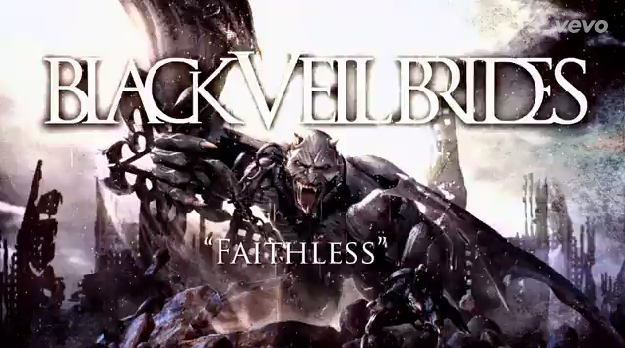 The Black Veil Brides have generated a lot of buzz surrounding their brand new fourth album to the point that they are releasing it a day early on October 27TH. The band had hired Bob Rock to produce the record and if you don’t know who Bob Rock is, he produced the biggest albums for bands like Motley Crue (Dr. Feelgood) and Metallica (The Black Album) and so much more. He took the helm and it’s obvious when you hear the brand new track Faithless which was just unleashed for fans to hear after Heart Of Fire was. The track features a pretty amazing intro with a bell tower clock that goes off in the intro of the song before the band shifts the gears into overdrive in a very Avenged Sevenfold Hail To The King-ish styled song. The song even features some blazing guitar solos in the track along with Andy’s unique vocal style. The production value is definitely present in this album and you definitely can tell Bob Rock pushed this band musically. I know that the Black Veil Brides are a heavily criticized band and they have been over the years, but think of what happened with hair metal bands back in the day before they became popular. A lot of people who rag in this group in the past are probably going to be big fans of theirs soon enough. Check out the track below and check out the cool bundles they’ve provided for their fans here. The 2014 Monster Entertainment Awards- You Vote!!! Here is your chance to let your voices be heard as you vote in each and every category that is provided that covers music, movies, and other fun categories. You will have from now until May 1ST to decide who wins. Choose wisely and have fun with it and spread the word. You may also want to remember that we are celebrating all the best of 2013 with the Monster Entertainment Awards. The 3RD Annual Monster Awards is back and we are ready to crown the best of 2013. As always, the awards are decided based on the participation of everyone which means it is up to you to crown the winners of each category. I’ve decided to get rid of some categories, but I have also added some brand new categories to the list. The category I have gotten rid of is the sports category because we don’t cover sports here, but we have kept one category and that is Wrestler Of The Year because it is sports entertainment after all. So, here are the categories and the nominees. The night that celebrates the genre that gets no respect, Metal, is back and due to the passing of a true Metal legend in Jeff Hanneman, the night was dedicated in his honor. The show kicked off with fellow Big Four legends Anthrax kicking into an amazing version of Caught In A Mosh. The band’s second song that they performed was off of Worship Music called Fight Em Till You Can’t and I have to say that I am so happy that Joey is the singer because he is just amazing. Anthrax ended their set by bringing out Phil Anselmo and Rex Brown to do This Love and dedicating it to Jeff Hanneman. They even ended the song with a little bit of Raining Blood just to top off the tribute. Chris Jericho was back for the fourth time to host the Fifth annual event. Chuck Billy and Alex Skolnick of Testament would come out to introduce Dillinger Escape Plan who started off their set with Prancer and the singer,Greg Puciato, would bust his own head open during the set. For their second song or maybe their third song of the set, they would invite Chino Moreno of The Deftones to perform Behind The Wheel which was the only song I enjoyed from their set and it featured Greg shooting flames with a torch and the band smashing their equipment in typical rock/metal fashion. After a heart felt tribute to Jeff Hanneman from Kerry King and Zakk Wylde, Heaven’s Basement came out to introduce Halestorm who started off their set with Love Bites. Before they kicked into I Miss The Misery, there was an amazing intro that featured some killer drumming from Arejay Hale. For their special guest, Halestorm brought out David Draiman to perform Led Zeppelin’s Whole Lotta Love and it was actually really good. Heidi Sheppard and Carla Harvey of The Butcher Babies along with Jill Janus Of Huntress came out to introduce Five Finger Death Punch who started their earth shattering set with Burn It Down. In what turned out be a shocking announcement, Five Finger Death Punch revealed that they had two CD’s coming out within the next six months and one of the tracks from one featured their special guest for the second track. Rob Halford came out to perform Lift Me Up with them dressed in a priest outfit. To top that performance, Five Finger brought out Rob Zombie and John 5 to perform Thunderkiss 65 together on stage. Maria Brink and Chris Howorth from In This Moment introduced Stone Sour to the stage as they opened up with Gone Sovereign. The second song the band performed was Absolute Zero and it absolutely rocked. Corey after the Zero was over said that before their guest came out, they were going to get the crowd started with their tribute to Sabbath as they began to play Children Of The Grave and sure enough during the song M. Shawn Crahan and Chris Fehn of Slipknot came out and performed with Stone Sour. It was absolutely off the charts and Corey definitely proved he deserved that vocalist of the year award. One of the funniest incidents occurred The Black Veil Brides were about to accept the award for best song of the year and the crowd was booing. Andy of BVB came right out and told the crowd off. Metal fans really hate The Black Veil Brides I guess. Papa Emeritus II of Ghost B.C. came out to introduce the one and only Danzig as he opened with Hammer Of The Gods not Mother according to the screen which would end up being the second track performed. Doyle Wolfgang von Frankenstein would eventually come out to perform Death Comes Ripping, Skulls and Last Caress with Danzig. Phil Campbell and Lemmy Kilmister came out to introduce the one and only Metallica as they came out and opened with Disposable Heroes. Most Dedicated Fans: Fans Of Him (just a little side note, I think Marilyn Manson should the biggest sign of disrespect to the band him).